KATE: My days of my attempted eloquence are over. There is too much to say now, and too little time spent quietly; we are so excited for our last hours in Bogota that even when we have a little time we fill it with something additional. KATE KASCH: Sunday we took in Bogota. Our guides and translators were Felipe and Patricia, a modern Colombian couple. They met here and have spent time in the US. He, as a Fullbright scholar at Harvard and she, as a youth in Maryland and at graduate school at Northeastern in Boston. In the spirit of Jesuit education that Loyola University Chicago provides, these six program participants have been inspired by the social justice mindset of Loyola as well as the international travel opportunities offered through the Quinlan School of Business Marketing classes. After discovering a love for both of these areas of study, program participants were inspired to continue learning about business and underserved populations in additional parts of the world, specifically Colombia. Colombia remains a disenfranchised country; as business students, the program participants believe that business is a vehicle for positive change in Colombia. 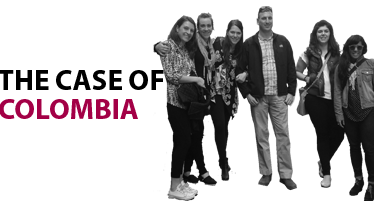 Program participants see ourselves as academic catalysts to Colombia, building on our academic experiences at the Quinlan School of Business and the mission of Loyola University Chicago. We have a personal sense of accountability as Quinlan School of Business students that what we say we believe in and value must be the way we operate. Therefore, program participants are excited to undertake this exclusive opportunity to leverage Professor Shultz’s 25 years of experience in devastated and recovering economies, and to conduct on-the-ground research first-hand in Colombia.